Whenever I see Banana Pepper in the vegetable market, I’m tempted to buy. 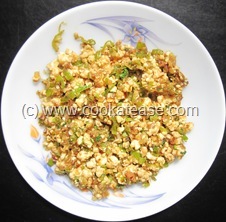 Mostly it is used to prepare Milagai Bajji. 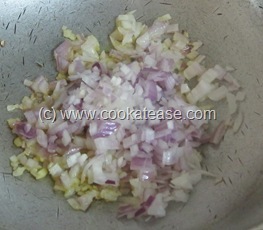 This time I wanted to prepare something different without deep frying. 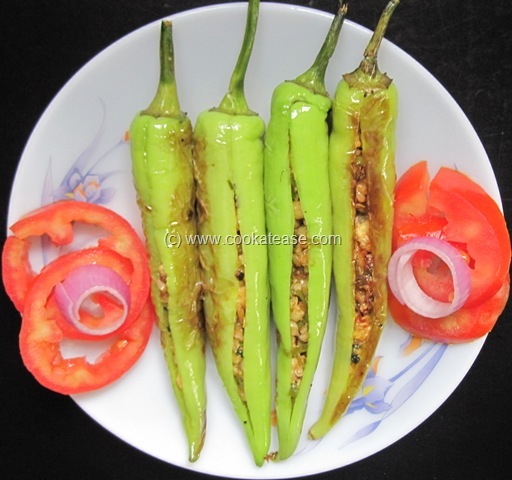 Here is Paneer Stuffed Banana Pepper using minimum ingredients. 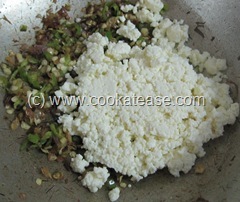 Paneer is Indian version of cheese. 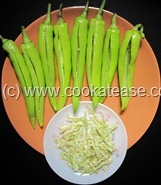 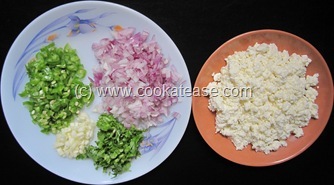 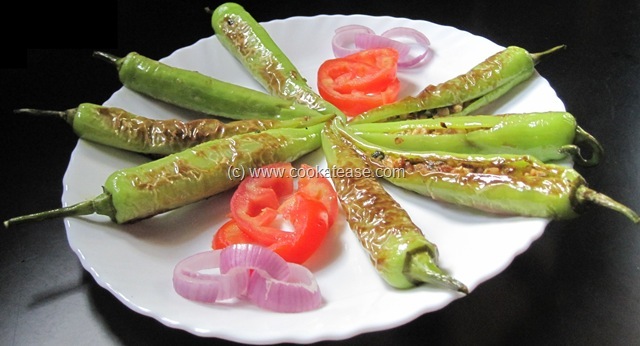 Cut banana pepper lengthwise as shown in photograph below; remove the seeds and other soft parts from inside (keep some seeds and soft parts for stuffing); crumble paneer finely; chop green chilli, onion, garlic, coriander leaves finely. 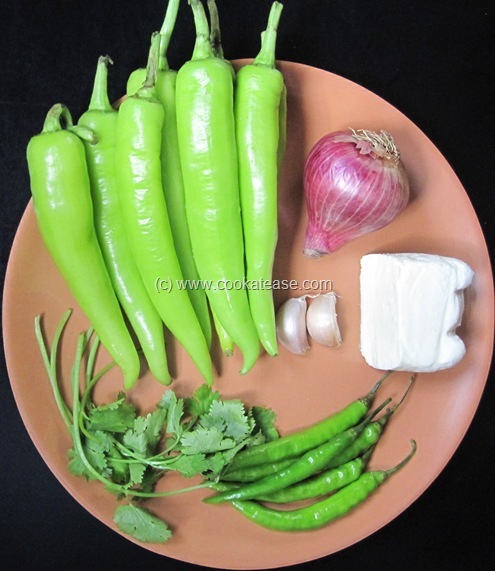 Paneer masala for stuffing: Heat a pan with one tablespoon of oil; add chopped onion and fry till it becomes transparent (do not add more oil in between, as paneer is likely to give out some moisture and fat when added). 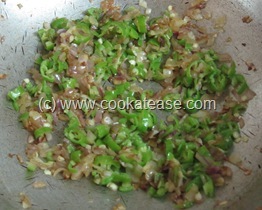 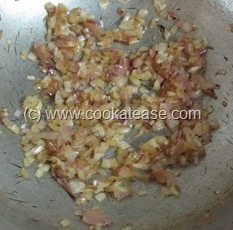 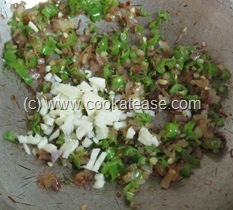 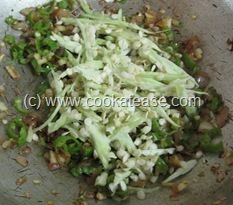 Add chopped green chilli, garlic and salt; fry for few seconds. 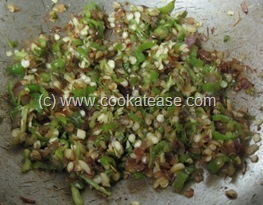 Add part of the seeds and other soft parts removed from banana pepper; fry for few seconds. 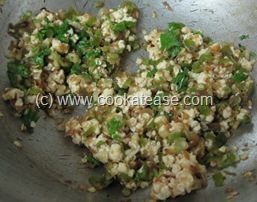 Now add crumbled paneer and stir for few seconds in low flame; add finally chopped coriander leaves, mix well (do not over cook) and remove; now paneer masala for stuffing is ready and let it cool down. Fill banana pepper with paneer masala evenly (do not over fill). 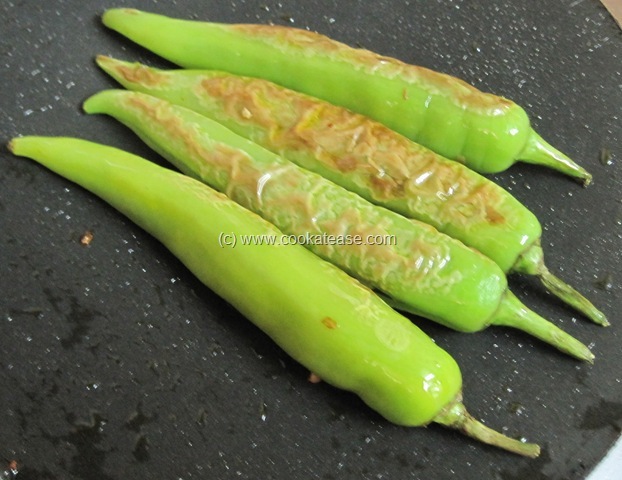 Heat a flat pan and fry banana pepper in low flame with minimum oil; in between roll the banana pepper so that it is cooked evenly; remove when done. 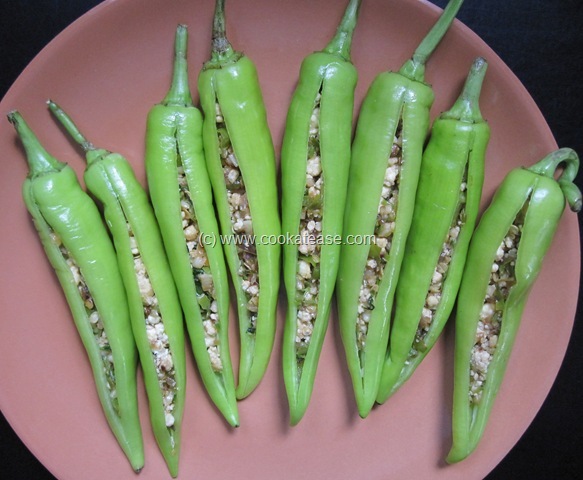 Tasty Paneer Stuffed Banana Pepper is ready. Serve hot as a side dish. 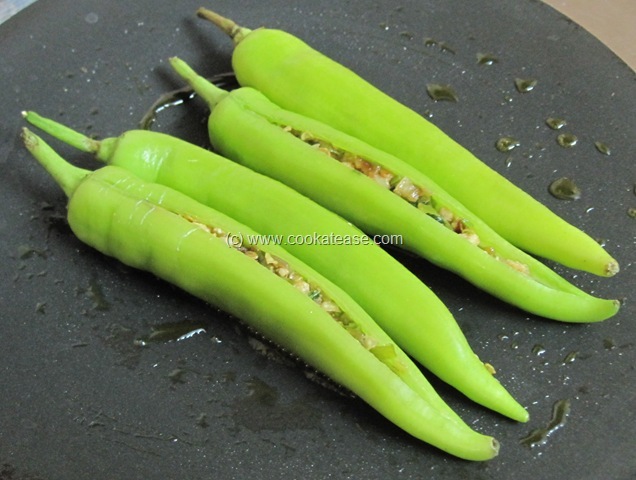 Use long straight banana peppers to ensure uniform cooking all around. 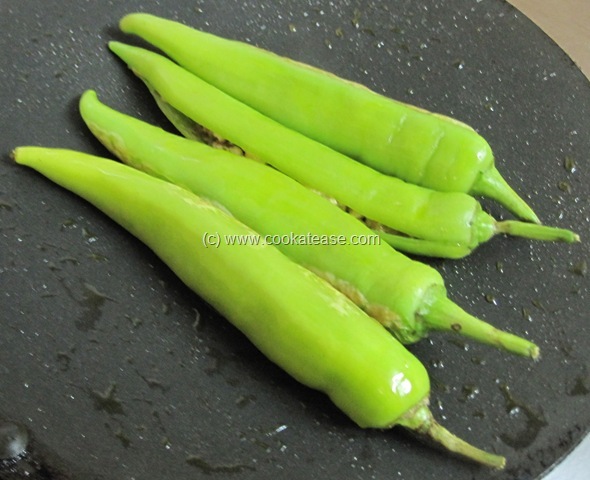 Avoid over filling of banana pepper with paneer masala, as it is likely to pop out while frying. Wow stuffed banana peppers very inviting..